The view from the north ridge of Government Peak. You can see the Independence Mine in the background. We looked north from the summit of Government Peak. From our perch, we could see deep into the Talkeetnas, tremendous mountains still mostly covered in snow. There was thick cloud cover and a brisk wind. It wasn’t quite cold but it was close enough. The ascent was not terribly difficult, a well-maintained trail the whole way up from the lowland forest to the high alpine tundra. The normal route up the mountain took us up the south face from the trailhead just north of Wasilla. Wilderness navigation can be difficult, but not here. Government Peak does not normally challenge your map reading skills. But this was not a normal Government Peak hike. 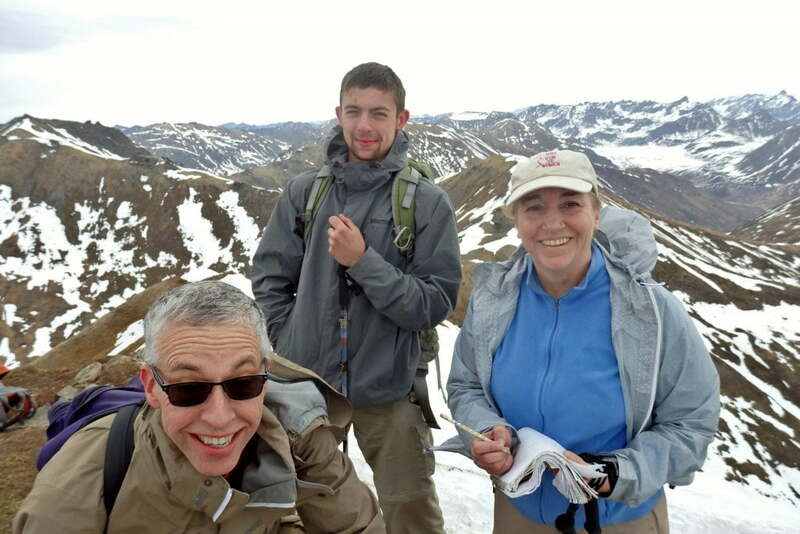 From left to right, my dad, me, and my aunt on the summit of Government Peak. She’s putting her name on the summit register. All credit for images again goes to my uncle, Chris. Thank you! 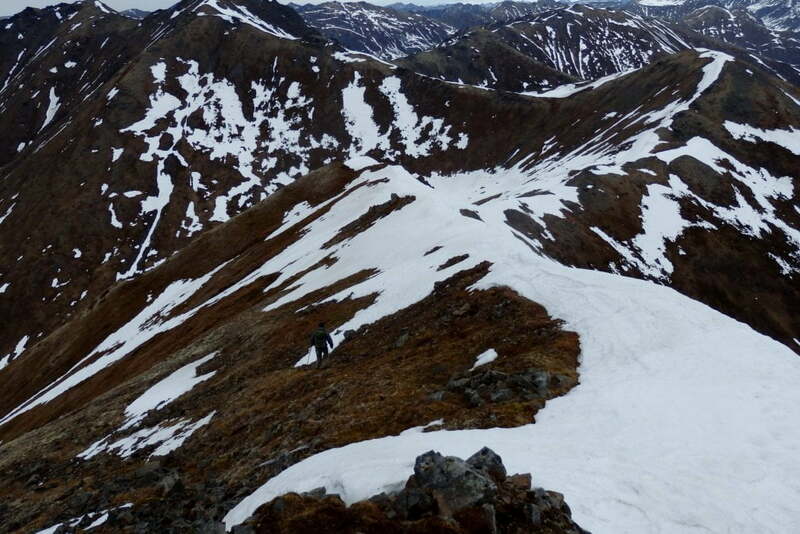 My uncle and I had decided to ascend the mountain as normal, from the south, but then descend the north face all the way down to the Independence Gold Mine on the Hatcher Pass road. We checked the map and decided it was perfectly doable, nothing too steep or rocky, and just a small creek to cross before arriving at the road. My uncle mentioned to me that very few people ever actually went up or down this mountain from the north side, but he was curious about the terrain there. We thought that the reason may be access since the Hatcher Pass road would add quite a bit of driving after the hike. This may be true, but we also found a few other reasons why people don’t attempt this peak from the north. If you look at the USGS grid for the Government Peak area, you’ll see that the mountain is fairly reasonable, not too steep and certainly not technical or dangerous. It was based on the map reading that we decided to try the north face. Nothing looked rough, and we had arranged our pickup on the road below. However, there were a few details we missed which ended up making our day… interesting. Remember the creek I mentioned earlier? It’s called Fishhook Creek, and we missed a few important details. First, it’s a bit more than a simple creek. It drains quite a large area of the mountains, all the way from Independence Mine and Hatcher Pass itself. Even worse, it was May, so snowmelt was in full force. We should have noticed all of this and realized that the creek would be quite full. We did not see that until we were standing beside the water. Oops. The view of the north ridge line from just below the summit. This was our route down. 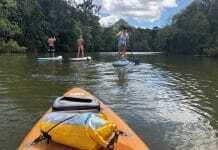 I’m right in the middle, a bit ahead of my uncle. Second, contour lines are really important. If you’re not familiar with reading USGS style maps, contour lines are little brown lines which indicate changes in elevation. The closer they are together, the steeper the terrain. We had checked out the contours of the north side of the mountain itself. Those weren’t so bad, meaning the mountain was not too steep. What we missed were the contour lines around Fishhook Creek. On our map, each contour line marked a one hundred foot elevation change. Fishhook Creek crossed five of these lines in about half a mile. Meaning the creek falls five hundred feet in half a mile. So not only was the creek draining a large area packed with rapidly melting snow, but it was also rather steep, meaning the water was moving very fast. We did not notice this while reading the map at home. We started off from the peak late in the afternoon. This descent is one of my favorite memories. The sprawling tundra in every direction, with the old gold mine a tiny red dot in the distance. There was still plenty of snow, not enough to be trouble, but more than enough to be beautiful. The wind was strong and it howled its way through the valley. 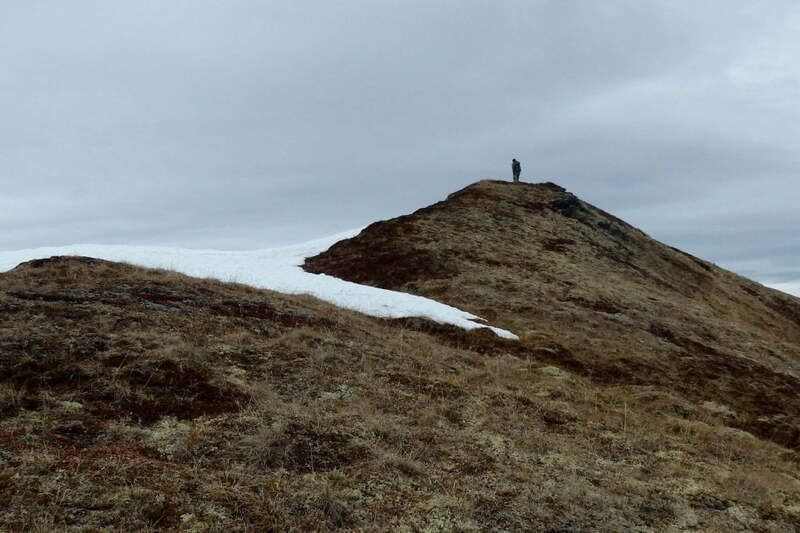 The tundra was still a deep brown color, as winter had not yet truly ended, and the overcast skies gave the place a beautifully desolate feel. Naturally, we were the only ones there and we took our time on the way down. There was no reason to rush. The Talkeetna Mountains from our ridge. I love views like this, looking deep into the wilderness. 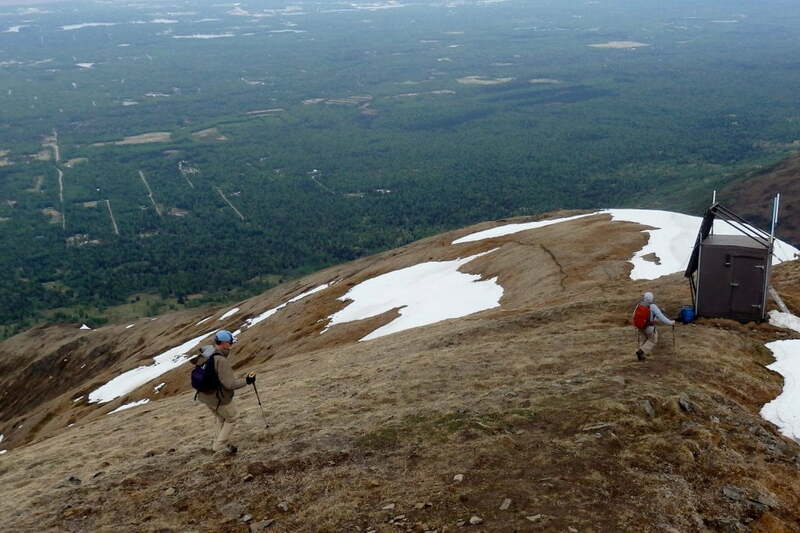 The north side of Government Peak is one, long ridgeline which runs almost due north from the peak itself. We followed this ridge. The hiking was easy and as I already noted, the atmosphere was truly breathtaking. 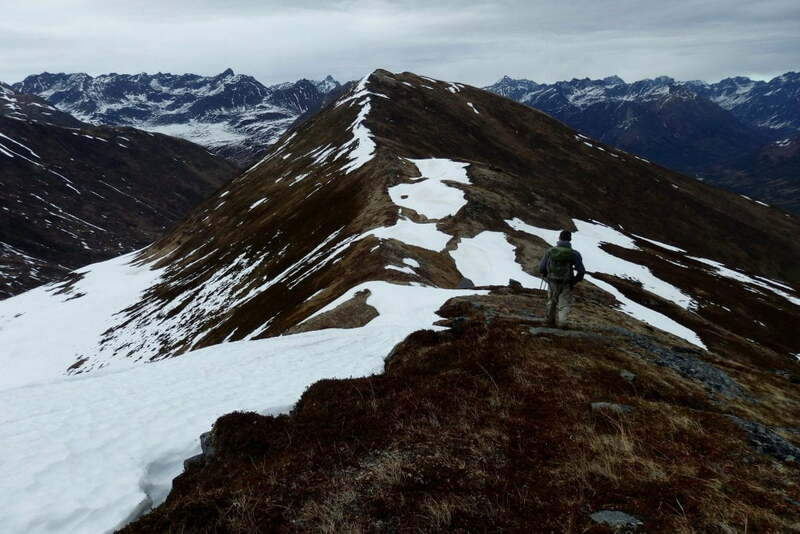 At a point, our ridge ran out and we made a rapid descent down to Fishhook Creek. It was steep but not too steep, though there were substantial patches of snow remaining. We actually slid down some of the snow to save effort, and for fun of course. 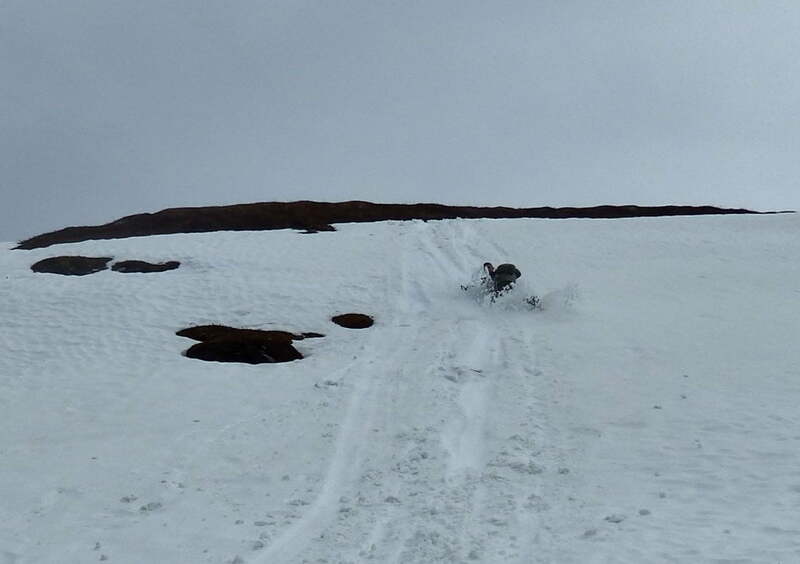 My somewhat controlled slide down a snowfield. This is called glissading, like sledding without a sled. The whole time we were headed downwards, the sound of the creek was growing louder. When we began to hit alder thickets, we knew we were close. The road was only about a quarter mile away, so we were basically done, right? We first noticed something was off even before the saw the creek. It was loud. Not deafening, but still loud. We stepped around a bit more underbrush and got our first good view of the water. It was fast. And deep. The ground just around the creek was narrow and rather steep. This wasn’t quite a ravine, but it was enough to make a fall into the water likely. And a fall into the water would mean getting pounded against the rocks. This was not the creek we were hoping for. Not a picture of the creek! It’s sign that a hike is getting stressful when you stop taking pictures. Unfortunately, the result is that we have no images of Fishhook Creek. It took us no time at all to decide that crossing was totally unsafe. Sure, maybe we could hop across on the rocks, but the risks of a fall were… substantial. Water is one of the most dangerous things in the wilderness. Every year, people die while trying to cross rivers. There is one universal rule of river crossings: You never actually have to cross. 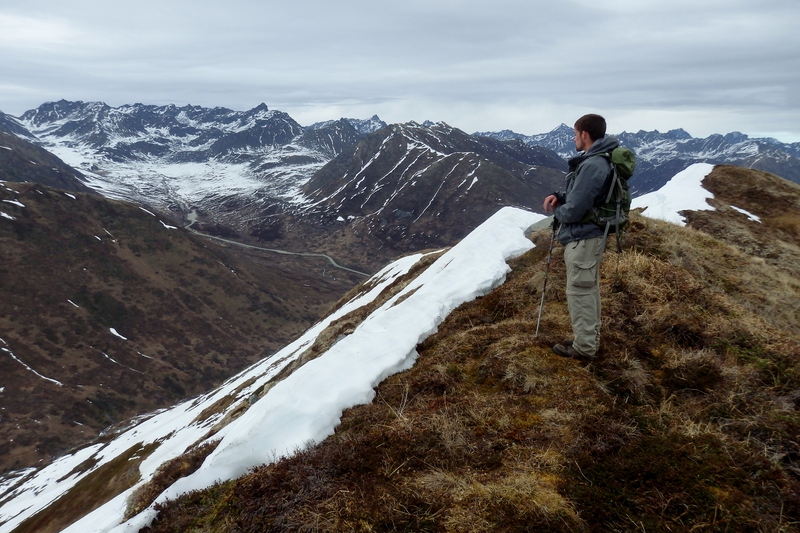 It would be better to turn back and retrace the entire hike than to risk your life trying to cross a remote Alaskan creek. We weren’t quite at the point of turning back yet though. This piece is a warning about navigation. We had failed to read our map correctly, and thus we had not foreseen a very real safety threat. However, we got ourselves out of this dilemma with some clever navigation and proper map reading. After stopping for a water break, we examined the map. Fishhook Creek drains quite a large area of the mountains, and we noticed a branch in the creek less than a mile upstream. Even better, there was a place on the Fishhook were the mapped showed the stream braiding just above the junction. And to seal that as our choice, that braided area of the creek looked pretty flat. In that place, the creek went about half a mile without crossing more than one contour line. Somewhat demoralized but far from ready to simply turn around, we made our way upstream. We came to this branch in the creek, the site of an old beaver dam, long since broken down. We made an easy crossing of the smaller branch, named Hatcher Creek because it runs directly up to the pass itself, and continued up the Fishhook. Just like the map had indicated, the creek braided into a few different streams at this point. We splashed across and climbed an embankment to the road. Our ride was a little late, so they picked us up about half an hour later. My father and aunt begin their way down the mountain. The normal way. There’s a good reason most everyone goes up and down the south face of the mountain. Though our misadventure began with a terrible misreading of our map, we saved ourselves from re-climbing the entire mountain with good map reading. Navigation in the wilderness can be quite difficult, especially since we are spoiled by our GPS devices in our daily lives. Good navigation really comes down to seeing the nuances of the map, the tiny details like how dense the contour lines are. And finally, the difference between a decent navigator and a truly good one is not that a good navigator never makes mistakes. Everyone messes up. But a solid navigator, kudos to my uncle here, knows how to find and correct errors before they become critical.